In memory of our friends and classmates who have gone too soon. If you are able to improve on any of the obituaries below we would love to hear from you. 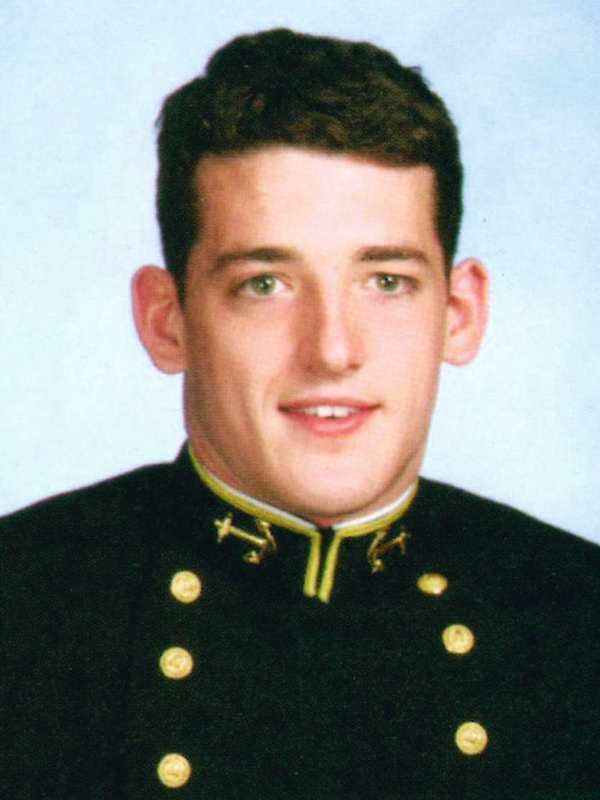 Steven L. Douglas died of cardiac arrest Dec. 5, 1998, in Annapolis, Md., while serving as a midshipman fourth class at the United States Naval Academy; he was 20. Memorial services were Dec. 9, 1998, at the U.S. Naval Academy in Annapolis. A funeral and burial took place in Visalia, Calif. A memorial service was held at Christ Lutheran Church in Soldotna, with the Rev. Randy Parshall officiating. Mr. Douglas is survived by his stepmother, Katherine Godek; stepsisters, Harmony Smith and Daneka Godek; grandparents, Truman and Jeanette Douglas; uncle, Glenn Siebert, all of Kenai; grandmother Ellen Siebert; uncle Robin Siebert; uncle and aunt, Scott and Pamela Seibert; cousins, Kristofer, Nicholas and Chelsie Siebert, all of Anchorage; uncle and aunt, Dennis and Mary Kaufman of Scots Valley, Calif.; uncle and aunt, Bill and Judy Downard of Escalon, Calif.; great-uncle and -aunt, Herb and Mae Constant of Danville, Calif.; cousins, Lisa Kaufman, John Kaufman, Denise Sharma, Sharon Sparvoll, Kathy Halpin and Debbie Cornella, all of California; mother, Janice Reagan of Dinuba, Calif.; and grandfather, Russ Patton of Visalia, Calif. He was preceded in death by his father, Leonard Douglas; and his grandmother, Marie Patton. Perhaps you knew Ken from the United States Naval Academy as a member of the Class of 2002, or as a member of the Glee club. Maybe you knew him as a Coast Guard junior, moving around the country making friends everywhere. Perhaps you met him in the hospital and were one of the many people who cared for him as he fought the battle that is leukemia. Maybe you were one of the thousands who were tested in hopes of finding the perfect bone marrow match. And maybe you were one of the many people who had not met him but prayed for him, and were amazed at the courage, strength, sense of humor, and faith exhibited by this brave young man as his body was ravaged in so many ways. We have all been touched by Ken. His life on earth, though much shorter than we would have hoped for, has made a difference in many lives. Ken is survived by his parents, Daniel and Wendy Neptun; by two brothers, Benjamin Neptun of Seattle and Donald Neptun of Tacoma, Wash.; and his four grandparents in Washington state. A nice article on Ken also appeared in the Baltimore Sun. Andrew Jacob Torres died on April 3, 2004, at USC Norris Comprehensive Cancer Center in Los Angeles, following a courageous battle with cancer. His parents, Leonard and Anita (Brenner) Torres; sister Rachel Torres, and girlfriend, Ens. Ana Ortiz, USN, were at his bedside. Andrew was 23 years old. Born at Huntington Memorial Hospital in Pasadena on Aug. 1, 1980, Andrew became interested in military service because his father served as a Marine officer with Force Recon in Vietnam and his great-uncle, also a Marine, fought in the Battle of Iwo Jima during WW II. Andrew attended local schools beginning with Pacific Oaks Childrens School through kindergarten, followed by La Canada and Palm Crest elementary schools, where local educator and former principal Don Hingst remembers him as a student who loved to play flag football, and as a personable young man with many friends. My last remembrance of him was at the memorial service that he organized for his good friend, Todd Bryant, who was killed in Iraq. Hingst said this week. "He looked so handsome and smart in his uniform. One would not know that his young life was threatened by cancer. I choose to remember him as a handsome, vital young man who loved his country and was willing to serve all of us in the military." Lieutenant Junior Grade Nicholas Juron died on December 13, 2005 during anti-drug operations when his SH-60B Seahawk crashed into the Pacific off the coast of Colombia just after launching from USS DeWert. He was a 1998 graduate of Great Mills High School and a 2002 United States Naval Academy graduate. Nick was a very bright young man, a gifted athlete, student, and a 'star' in every sense of the word. He received a perfect score on his SAT, was a member of the National Eagle Scout Association, and earned a spot on the USA Rugby team. But his intention was always to make a career in the Navy. "Nick’s sacrifice will always be remembered by a grateful community, state, and nation," Congressman Steny H. Hoyer said of the late lieutenant. Lt. Richard Francis Andersen, Jr., USN, 27, of Virginia Beach, VA, passed away May 7, 2007 in Nevada. Born in Honolulu, Hawaii, he was a helicopter pilot with the United States Navy for the last 5 years. He was a 1998 graduate of Princess Anne High School and a 2002 graduate of the U.S. Naval Academy. He attended the Little Creek Amphibious Base Chapel. Richard is survived by his parents, CDR and Mrs. Richard F. Andersen, USN (Ret.) of Virginia Beach, VA; and his two sisters, Rachel Marie Andersen of Virginia Beach, VA and Elizabeth Ann Bohn and her husband Brian of Richmond, VA.
A funeral service was conducted at the Norfolk Naval Base Chapel with Fr. Joseph Ceriello officiating. The burial followed at Forest Lawn Cemetery. In lieu of flowers, if so desired, the LT Richard F. Andersen, Jr. Memorial Scholarship Fund has been established at the Navy Federal Credit Union, 4001 Virginia Beach Blvd., Suite 132, Virginia Beach, VA 23452. Robert Dean Balloon, 28, of Gainesville, Florida, passed away Saturday, April 5, 2008 in Gainesville. He was Vice President of NBC Securities in Gainesville, where he served as an Investment Advisor for Millennium Bank. He also was a member of First Baptist Church of Gainesville. Rob was born on January 22, 1980 in Winter Park, Florida. He graduated with an International Baccalaureate Diploma from Eastside High School in 1998. At Eastside, Rob played Varsity Soccer for 4 years. Following high school, Rob attended the United States Naval Academy in Annapolis, Maryland where he played Varsity Soccer. He then graduated with a Bachelor of Science degree from the University of Florida in 2003. Rob was predeceased by his grandfather, Winfred Hazen, of Gainesville. He is survived by his parents, Susan and Don Balloon, of Gainesville, his brother Tony and his wife Shannon and their son Grayson of Brussels, Belgium, and his brother Scott and his Fiancée Lauren Anderson of Jacksonville, Florida. He is also survived by his grandparents Ruth Hazen, of Gainesville, and Doris and William Balloon, of Wooster, Ohio. Captain Matthew C. H. Freeman, USMC, was killed in action on 7 August 2009. He was 29 years old. Matthew was born in Lake Forest, IL, and spent most of his life in Richmond Hill, GA. He was a graduate of Richmond Hill High School, where he was a member of the tennis team, president of the Student Council and a member for four years, and a member of the Literary Club. In 1998, he earned the "Student of the Year" Award from the Richmond Hill Exchange Club. Matthew was an Eagle Scout and a life long member of the Richmond Hill United Methodist Church. After high school, he entered the United States Naval Academy, graduating in 2002 with an aerospace engineering degree. He received third generation naval aviator wings, passed down from his grandfather Rear Admiral DeWitt L. Freeman, USN (Ret. ), and his father Commander Gary M. Freeman '76, USN (Ret.). He served as the aide-de-camp to Major General Kenneth J. Glueck Jr USMC, Commanding General Second Marine Aircraft Wing. Matthew was stationed in Okinawa, Japan, with VMGR-152 where he flew the KC-130J aircraft. He volunteered for an individual augment position with Fourth Marmes Embedded Training Team, which deployed to Afghanistan in support of Operation Enduring Freedom. It was while serving with this unit that he was killed in action. Matthew is survived by his wife, Theresa Hess Freeman of Richmond Hill; parents, Commander Gary Freeman, USN (Ret), and Lisa Freeman of Richmond Hill; sisters, Marybeth Macias (Staff Sergeant Michael Macias, USAF), and Ginny Freeman of Richmond Hill; brother, Harrison Hays of Evanston, IL; maternal grandparents, Commander James Baumgardner, USN (Ret. ), and Betty Baumgardner of Yorktown, VA; paternal grandfather Rear Admiral DeWitt Freeman, USN (Ret. ), of Louisa, VA; paternal grandparents, Yvonne and Charlie Hays of Dallas, TX; nephews, Rowdy Macias of Tacoma, WA, and Brendan and Patrick Hess of San Antonio, TX. He is also survived by Mark and Paula Hays of Evanston, IL; and many loving aunts, uncles and cousins. A great Washington Post article on Matthew Freeman's 2009 memorial service at USNA can be found here. Also, visit The Matthew Freeman Project for more about his family and their work in his name. Our friend John Cabigon died of liver cancer on September 1st, 2009; he was 31. John leaves behind an amazing wife, Gina, who has been his rock while also preparing for their first child. Jessie Ann will never know her father, having arrived a week after he died. However, she will know a world that is a richer, happier place because of Cabby's passage through so many lives. As his classmates, we looked to him for his experience as a prior-enlisted sailor; we counted on his optimism as the most indomitable person we'd ever met; we depended on his camaraderie as an incredible and devoted friend. Cabs (or Cabby; infrequently was he "John") was a trusted adviser and sage mediator whose high standards simply made everyone around him better. He gave of himself to friends and strangers alike without question or thought of repayment. Calm and competent, decisive and determined, firm yet fair, Cabs was a leader of leaders and a Naval Officer worthy of that title in every respect. Examples of his generosity and caring are easy to come by. Phil Ely ('02) tells that "at John's 30th birthday party, he was the one giving out presents, just as a way to thank people for coming. He's only guy I've ever known who would do something like that. Also, before my wife and I left Hawaii last year, our last night on the island was at dinner with John and Gina. John gave Melissa and me a framed picture taken of the four of us at their wedding, which had been just a few weeks earlier. John was a true friend. The best word I can think of to describe him is 'genuine.'" As one of Cabby's Commanding Officers in USS COWPENS, Captain Buz Sorce ('81) was in a unique position to see John in his element as a Surface Warfare Officer. "I have the pleasure of knowing that in his shortened career John still has a lasting influence in our Navy. He was a professional and hard working junior officer. As the Strike Officer his division was well off of my radar screen — where all Divos want to be — and his Tomahawk teams proved ready and able for all inspections and exercises. I slept well when John had the deck, which demonstrates better than anything my confidence in his knowledge, and, more importantly his sound judgment. No doubt John's greatest gift to our team was his true spirit of 'Aloha.' His positive outlook and confidence were contagious throughout my wardroom and on the deck plates. He helped bring calm to a very busy forward-deployed Cruiser and this attitude is the gift many of us will take forward for the rest of our lives." John has gone home now, guided by the light of those that he has loved and who have loved him. He left us with the memories he gave, the good that he did, and the unlimited promise of a daughter who will undoubtedly carry his smile, his optimism, and his inherent goodness to a country who has lost one of her finest sons. But as we came to find out, Joe was much more than an easily memorized Plebe rate; Joe was the embodiment of the Naval Academy mission. He was disciplined, methodical, quick to praise others, selfless in his time with friends, a servant who participated in humanitarian causes outside the Academy, and above all else, wholly devoted to the Navy and his country. The hallmarks of Joe that we in 2nd Company came to know were: a pristine uniform, flawless physical conditioning, a humble manner, and perhaps a late study light that always seemed to be burning. Joe was an exemplary midshipman, scholar and patriot who yearned to be a leader. Joe always charted his own course. Our company officer once affectionately called Joe "one of his rebels." That comment wasn’t intended as a smear, but rather as an acknowledgment of Joe’s free spirit, a free spirit that propelled him to critically examine issues, to spend his off hours on countless adventures ranging from learning to scuba dive to qualifying as a free-fall parachutist. He was as comfortable lending a hand in training plebes on Saturday morning as he was sitting down with a classmate to talk about his faith. Ultimately, Joe knew exactly who he was and wasted no time at the Academy or in his career in pursuing his goals. His unassuming nature was juxtaposed with a relentless self-confidence that put others at ease and engendered trust in those who served with him. After commissioning, Joe pursued one of his lifelong dreams to become a helicopter pilot, and completed two deployments in support of combat operations. At the time of his death, Joe could not have been more ecstatic about the direction of his life. He was excited to give back to his community as a flight instructor, and as a helicopter pilot, thrilled with the challenge of getting behind the stick of an airplane again. Lastly, Joe spoke to me in recent months with great fondness about the opportunity to serve near his family in his beloved home state of Texas and the blessing of new love in the arms of his fiancée, Jenn. Joe leaves here on Earth a beloved fiancée, Jennifer, a beautiful son, Asher, age 5, two incredible parents, John and Glyndell, a brother Jimmy and a sister-in-law, Kendra. He was a man who had supreme faith in God, and we believe is resting in His presence now. Timothy Ray, a 3rd year doctoral student at Scripps Institution of Oceanography, passed away suddenly at his home on May 16, 2011. In his 31 years, Tim led a remarkably full and varied life. He was a graduate of the U.S. Naval Academy (B.S. Oceanography, 2002) and the Naval Postgraduate School, Monterey (M.S. Physical Oceanography, 2003), and he served in the U.S. Navy until 2007 as a Naval Oceanographer. Tim was an extraordinary athlete, as a distance swimmer while at Annapolis, and recently as a core member of the UC San Diego Triathlon Team. He'd completed the Boston Marathon in April 2011. Tim was an outdoorsman with a strong and personal commitment to living in tune with the planet and practicing environmental sustainability. As an oceanographer and climate scientist, Tim's work at Scripps meshed perfectly with his life. He was carrying out pioneering research on interannual variability in ocean salinity, using new data from the Argo Program. His concept of salinity as the "Oceanic rain gauge" was demonstrating that regional variations in Tropical Pacific evaporation and rainfall could be monitored very sensitively from their accumulated impacts on ocean salinity. Beyond the basic science, as a student in the Integrative Graduate Education and Research Traineeship (IGERT) program, Tim's unique commitment was to understanding the societal value and implications of his research on the Earth's freshwater cycle, and to communicating this to the public and to policy makers. His poster on the "Oceanic rain gauge" was a finalist in the IGERT national poster competition in Washington, D.C., in 2011. Tim is survived by his parents, Larry and Julie Ray, by his two brothers, and by an amazing number of friends and colleagues whose lives his had touched and moved. viaCenter for Marine Biodiversity and Conservation… though the link does not appear to work any longer. Kenneth Brent Faires, 33, of Seattle, died April 12, 2014, at his residence. Born July 21, 1980, in Catawba County, NC, he was a son of the late Richard B. Faires and survived by his mother Joyce Faires. He was educated at South Caldwell High School, the U.S. Naval Academy, North Carolina State University, the U.S. Navy, and Washington State University. After years of dedicated study and distinguished service in the U.S. Navy, Ken finished his PHD in engineering from Washington State University in 2013. His lifelong projects were aimed to better the world we live in by saving our forestry and increasing the use of renewable resources. Ken was a man of many talents and while often quiet, he would come alive when talking about science and the potential for it to better both man and the Earth. The world has suffered a great loss with his mind now at rest. While a man of vision, Ken never hesitated to stop and help out his fellow man. He gave all to see others supported and cared for, far above his own needs or wants. He always managed to touch the lives of everyone around him and inspired nothing less than fierce loyalty from those he called friend. In addition to his mother, Ken is survived by his sisters Penny and Angie; Angie's three children, Mandy, Brett and Trey; and by his brother Jason – though not by blood a brother just the same. John William Cude, of New Braunfels, Texas passed away Tuesday, August 18, 2015 at the age of 38. John was born in Nuremburg, West Germany on January 3, 1977 to parents William and Ruth Cude. John graduated from the U.S. Naval Academy in 2002, and served on board the submarine USS Rhode Island (SSBN-740) until his honorable discharge in 2004. He was a member of the U.S. Naval Academy Alumni Association. John is survived by his daughter, his parents, and his sister Nancy. A memorial service was held on Friday, August 21, 2015 at 11:00am at Doeppenschmidt Funeral Home in New Braunfels. Pastor Rich Van Natter led the service. Burial of cremains took take place on Monday, August 31, 2015 at Ft. Sam Houston National Cemetery in San Antonio, Texas with full Naval funeral honors. In lieu of flowers, memorial donations honoring John may be made to the U.S. Naval Academy Foundation, 247 King George St., Annapolis MD 21402. On July 6th, 2016 we lost a good soul from our class. Many of you knew Eric at the Academy (Systems Engineer, 28th Company). Some of you crawled through the mud at TBS or flew with him in the fleet. He might even have backed up some of the Marines among us with close air support as a Cobra pilot. Those of us in 28th knew Erik as a quirky, often silly guy who smiled easily. He wasn't a boisterous or big personality, but he had strong convictions, deep spirituality, and rock solid integrity. Erik was not one to BS you. He told you how it was, but never with an inflated ego. We remember walking into his room 2nd class year as he was doing eye straining exercises to improve his odds of being selected for pilot. Some of us were a bit surprised when he selected Marines, given his slightly goofy side and his disdain for various Gunnys' power trips during drill practice. However, Erik had an intensity and fierce loyalty that would bring him success in the Corps and as an aviator. As a Marine aviator, Erik “Backstreet” Boyce proved to be the consummate professional. He was winged in 2004, and as part of Marine Light Attack Helicopter Squadron 369 (HMLA-369), the “Gunfighters,” Erik flew the AH-1W Cobra in hundreds of missions during three deployments to Iraq. He led Marines both on the ground as the Legal Officer, Flightline Officer-in-Charge, and Pilot Training Officer and in the air as a flight leader during numerous named combat operations. He was a graduate from the Marine Weapons and Tactics Instructor Course in 2008 and steadfastly mentored those Marines in his care, epitomizing the phrase, “a good Marine.” However, Erik’s impact moved well beyond the classic description. Erik could always be counted on as a sounding board, a trusted friend, and an invaluable resource in all matters, personal and professional. With a passion for serving others, Erik cultivated friendship and comradery in those around him and with his dry sense of humor, was a unifying force in tough times. He was truly loved by his squadron mates and consistently proved day in and day out that he had all the “right stuff”. His personal awards include the Air Medal with Strike/Flight #15, the Navy and Marine Corps Commendation Medal, and Navy and Marine Corps Achievement Medal. When asked about his impressive combat record, Erik might give you a laconic answer along the lines of, "Yep, we did a lot of flying. It was hot." After his three combat deployments, he was selected to attend the U.S. Naval Test Pilot School in 2009, graduating in 2010. He was a quiet, humble, and consummate professional who would never have told you that he graduated at the top of his Naval Test Pilot School Class. As a test pilot, Erik brought his deep intellect and eye for detail to every task, big or small. For those of us who did not fly with him, we can only imagine how many hairy situations he got himself into and out of - each time with his trademark smile and calm wits about him. Erik met his wife Sarah while stationed in San Diego, and they have a 9 month old daughter, Theresa. It is heartbreaking that Theresa won't know her father as we knew him. To this end, we are collecting stories and pictures of Erik so that she may someday understand the good man that we knew and served with. A private memorial service will be held in Spokane, WA. To respect the Boyce family’s privacy, we are working through the Marine CACOs who are supporting his family. Please reach out to our classmate (and Erik’s squadron mate) Ryan Fair at rkfair02@gmail.com for further details. Boyce, we miss you shipmate. Semper Fidelis and God Bless your family. Whitney Philip Charles Saunders, age 36, passed away at his home in Baton Rouge on Tuesday, October 18, 2016. Whitney was born to Lee Pitre and Richard Saunders on February 4, 1980 in Austin, TX. He was the darling husband of Alison Saunders, his wife of nine years. He is survived by his parents and his brother, Shelby Saunders (Valerie), his grandmother Winnie Saunders, his stepfather Patrick Lynch, and his stepmother Nancy Saunders. He also leaves behind his beloved dogs, Fritzi and Duke, and his cats, Maggie and Buster. He will be sorely missed by an extensive network of aunts, uncles, cousins, colleagues, and friends. Whitney graduated from Episcopal High School, where he was a National Merit Scholar, and attended the United States Naval Academy in Annapolis, MD. He later matriculated at Tulane University before graduating with a Bachelor of Arts from Louisiana State University. In 2011, he obtained his Masters of Business Administration from the E. J. Ourso College of Business, Louisiana State University. He was most recently employed as a grants analyst at the Our Lady of the Lake Mid City Clinic in Baton Rouge. He was passionate about his work in the Early Intervention Clinic and the administration of the Ryan White HIV/AIDS Program grant. Whitney was an avid reader and enjoyed travel, especially to theme parks, Renaissance festivals, and Europe. He had a facility for languages and loved to play soccer, pub trivia, and board games. He was a bon vivant who loved wine and good food, and to cook great meals at home. He was generous, sensitive, and caring, and deeply concerned about the well-being of his friends and family. Whitney was preceded in death by his grandparents, Lula Lee and Harold Pitre, grandfather Donald Saunders, and his father-in-law, Glen R. Bordelon. In lieu of flowers or gifts, please consider supporting the National Alliance on Mental Illness Baton Rouge in their mission to help families reclaim a future for themselves and their loved ones, and to remove the stigma associated with mental health issues.